2 Weeks ago I made my first trad. harvest.It was a cloudy/rainy day.Was shot from my tree quartering away @ 15 yds.Went in high on left and low on right and was broke in half.Poured so hard I decided to grid search instead of looking for blood.Found him about 100 yds from my tree.The feeling w/trad. gear was unexplainable. 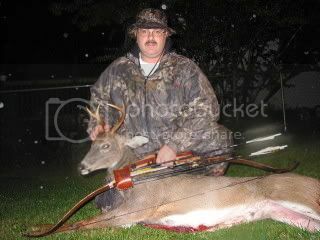 Good one Pete , thats a ripper buck and a good 1st animal thats for sure , what are the specs on your bow mate , she is a Widow I can see that , whats the poundage and such ? Thanks guys! Merciful,its a MAIII 60" 53#@29",my draw is 28.75".I shoot a 31" CX 300 w/a wgtd. 140 Magnus 2 bld.Again thanks. There's nothing like your 1st Trad Kill,it's Awesome!